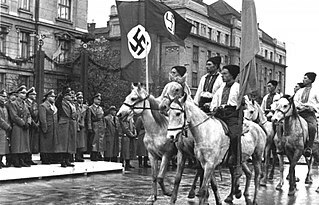 Ukrainian collaboration with Nazi Germany took place during the military occupation of modern-day Ukraine by Nazi Germany in World War II. At that time the new territorial divisions included Distrikt Galizien and Reichskommissariat Ukraine covering both, the south-eastern territories of the Second Polish Republic and the Ukrainian Soviet Socialist Republic across former borders. Original reasons for collaboration included Ukrainian political aspirations for regaining independence, resurgent nationalism, but also anger and resentment against the Soviet government and ethnic Russians for Holodomor, mass arrests and deportations, and executions that occurred in Soviet Ukraine due to accusations of collaborations with Nazi Germany only a few years earlier, particularly among the intelligentsia who were disproportionately targeted. These sentiments were coupled with the belief that these acts were orchestrated by other ethnic groups (such as Jews, Tatars, Roma people, and Poles) as well as the prevailing notions of anti-Semitism. However, the absence of Ukrainian autonomy under the Nazis, mistreatment by the occupier, and the deportation of hundreds of thousands of Ukrainians as slave laborers, soon led to a dramatic change in the attitude of some collaborators. By the time the Red Army returned to Ukraine, a significant number of the population welcomed its soldiers as liberators. More than 4.5 million Ukrainians joined the Red Army to fight Nazi Germany, and more than 250,000 served in Soviet partisan paramilitary units, dwarfing the numbers of Hiwi's and other anti-soviet soldiers, even in the early years of the war. Stalin and Hitler pursued the policy of territorial demands on their immediate neighbour, Poland. The Soviet leader, Joseph Stalin, wanted to prevent further influx of German troops through Poland, as  Hitler pursued his own policy of Lebensraum in the East. The Soviet invasion of Poland brought together Ukrainians of the Soviet Ukraine and the Ukrainians of what was then Eastern Poland (Kresy), under the single Soviet banner. In the territories of Poland invaded by Nazi Germany, the size of Ukrainian minority became negligible, gathered mostly around UCC (УЦК) formed in Kraków. Distrikts Galizien Spring 1943. Celebrations dedicated to the creation of the SS Division Galicia. Less than two years later, Nazi Germany attacked the Soviet Union. The invasion, known as Operation Barbarossa, began on June 22, 1941, and by September, the occupied territory was divided between two brand new German administrative units, the District of Galicia of the Nazi General Government and the Reichskommissariat Ukraine stretching all the way to Donbas by 1943. Ukrainians who chose to resist and fight German occupation forces joined the Red Army or the irregulars. However, in newly annexed portions of eastern Ukraine there was little to no loyalty towards the Soviet Union; the region had only been part of the U.S.S.R since its seizure by the Red Army during the Soviet invasion of Poland in September 1939. Although the Ukrainian SSR did give the people a degree of national and cultural autonomy anti-soviet sentiment still existed. From 1931-1933 millions of Ukrainians starved to death in the Holodomor, a deliberate attempt at extermination orchestrated by the soviet government and from 1937-38 thousand members of intelligentsia were exiled, sentenced to Gulag labor camps or executed, due to accusations of collaborating with Nazi Germany. Professor Ivan Katchanovski writes that during the war the leadership of OUN B and UPA was heavily engaged in Nazi collaboration. He wrote that at least 23% of its leaders in Ukraine were in the auxiliary police, Schutzmannschaft Battalion 201, as well as in other police formations. 18% took part in training in Nazi Germany's military and intelligence schools in Germany and Nazi-occupied Poland, 11% served the Nachtigall and Roland Battalions, 8% in local administration during the Nazi occupation, and 1% in the SS Galicia Division. According to Katchanovski, the percentage of Nazi collaborators among the OUN-B and UPA leadership is likely higher than those numbers, since much data from early occupation is missing. Despite initially acting warmly to the idea of an independent Ukraine, the Nazi administration had other ideas, in particular the Lebensraum programme and the total 'Aryanisation' of the population. They preferred to play Slavic nations out one against the other. OUN initially carried out attacks on Polish villages, trying to exterminate Polish populations or expel Polish enclaves from what the OUN fighters perceived as Ukrainian territory. When OUN help was no longer needed, its leaders were imprisoned, and many members were summarily executed. The arrests were only temporary however according to professor Katchanovski; while 27% of the leadership of OUN B and UPA were arrested at one time, they were released relatively soon or allowed to escape. According to Timothy Snyder, "something that is never said, because its inconventient for precisely everyone, is that more Ukrainian Communists collaborated with the Germans, than did Ukrainian nationalists." Snyder also points out that very many of those who collaborated with the German occupation, also collaborated with the Soviet policies of the 1930s. The German Operation Barbarossa of 1941 brought together native Ukrainians of the Soviet Ukraine, and the prewar territories of Poland annexed by the Soviet Union as well. To the north-east, they fell under the German administrative control of Reichskommissariat Ukraine; and to the south-west, under the Nazi General Government. The Ukrainian Insurgent Army (UPA) volunteered to assist the Wehrmacht. In total, the Germans enlisted 250,000 native Ukrainians for duty in five separate formations including the Nationalist Military Detachments (VVN), the Brotherhoods of Ukrainian Nationalists (DUN), the Galician Division of the Waffen SS, the Ukrainian Liberation Army (UVV), and the Ukrainian National Army (Ukrainische Nationalarmee, UNA). By the end of 1942, in Reichskommissariat Ukraine alone, the SS employed 238,000 Ukrainians and only 15,000 Germans at a ratio of 1 to 16. The atrocities against the Jewish population during the Holocaust in Ukraine started within a few days of the beginning of the Nazi occupation. There are indications that the Ukrainian Auxiliary Police, formed on 20 August 1941, was used in the round-up of Jews for the Babi Yar massacre, and in other massacres in cities and towns of modern-day Ukraine, such as Stepan, Lviv, Lutsk, and Zhytomyr. On 1 September 1941, Nazi-sponsored Ukrainian newspaper Volhyn wrote: "The element that settled our cities (Jews)... must disappear completely from our cities. The Jewish problem is already in the process of being solved." Reinforced through religious prejudice, anti-Semitism had turned violent in the first days of the German attack on the Soviet positions in eastern Poland. Some Ukrainians derived nationalist resentment from the belief that the Jews had worked for Polish landlords. Also, the murders of prisoners by the Soviet secret police retreating eastward, were blamed on the Jews. Antisemitic canard of Jewish Bolshevism provided justification for the revenge killings by the ultra-nationalist Ukrainian militias which accompanied German Einsatzgruppen moving east. In Boryslav (prewar Borysław, Poland, with population 41,500), the SS commander gave an enraged crowd – who had seen bodies of men murdered by NKVD and laid out in the town square – 24 hours to act as they wished against the Polish Jews; they were forced to clean the dead bodies, to dance, and then killed by beating with axes, pipes, etc. The same type of mass murders took place in Brzezany. During Lviv pogroms, some 7,000 Jews were murdered by Ukrainian nationalists led by People's Militia. As late as 1945, Ukrainian militants were still rounding up and murdering Jews. 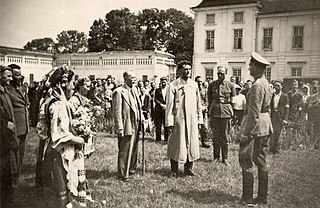 While some of the collaborators were civilians, others were given choice of enlisting for paramilitary service beginning in September 1941 from the Soviet POW camps, due to ongoing close relations with the Ukrainian Hilfsverwaltung. In total, over 5,000 native Ukrainian soldiers of the Red Army signed up for training with the SS at a special Trawniki training camp, to assist with the Final Solution. Another 1,000 of them defected during field operations. Trawniki men took major part in the Nazi plan to exterminate European Jews during Operation Reinhard. They served at all extermination camps, and played an important role in the annihilation of the Warsaw Ghetto Uprising (see the Stroop Report) and the Białystok Ghetto Uprising among other ghetto insurgencies. Ukrainian natives were offered choice unavailable to Russian soldiers dying of starvation and exposure in the POW camps for the Red Army. [improper synthesis?] The men who were dispatched to death camps and Jewish ghettos as guards were never fully trusted, and always overlooked by Volksdeutsche. Occasionally, along with the prisoners they were guarding, they would kill their commanders in the process of attempting to defect. In May 2006, the Ukrainian newspaper Ukraine Christian News commented: "Carrying out the massacre was the Einsatzgruppe C, supported by members of a Waffen-SS battalion and units of the Ukrainian auxiliary police, under the general command of Friedrich Jeckeln. The participation of Ukrainian collaborators in these events, now documented and proven, is a matter of painful public debate in Ukraine." 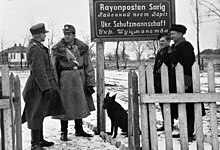 German officers visiting the Schutzmannschaft unit in Zarig, near Kiev. 109, 114, 115, 116, 117, 118, 201-st Ukrainian Schutzmannschaftant-battalions participated in anti-partisan operations in Ukraine and Belarus. In February and March 1943, the 50th Ukrainian Schutzmannschaftant-battalion participated in the large anti-guerrilla action «Operation Winterzauber» (Winter magic) in Belarus, cooperating with several Latvian and the 2nd Lithuanian battalion. Schuma-battalions burned down villages suspected of supporting Soviet partisans. On March 22, 1943, all the inhabitants of the village of Khatyn in Belarus were burnt alive by the Nazis in what became known as the Khatyn massacre, with participation of the 118th Schutzmannschaft battalion. On 28 April 1943 the German Governor of District Galicia, Otto Wächter, and the local Ukrainian administration officially declared the creation of the SS Division Galicia. Volunteers signed for service as of 3 June 1943 numbered 80 thousand. On 27 July 1944 the Galizien division was formed into the Waffen-SS as 14. Waffen-Grenadier-Division der SS (gal. Nr. 1). The prevailing belief is that these men eagerly volunteered to take part in a patriotic war against the Soviets, not because of any support for Nazi Germany. Also, at least some of them were victims of compulsory conscription, since Germany had now suffered defeats and lost manpower on the eastern front. Sol Litman of the Simon Wiesenthal Center state that there are many proven and documented incidents of atrocities and massacres committed by the Waffen-SS Galizien against minorities, particularly Jews during World War II. However other authors, including Michael Melnyk, and Michael O. Logusz, maintain that members of the division served almost entirely on the front lines against the Red Army and defend the unit against the accusations made by Litman and others. Official SS records show that the 4,5,6 and 7 SS-Freiwilligen regiments were under Ordnungspolizei command at the time of the accusations. (See 14th Waffen Grenadier Division of the SS (1st Ukrainian)#Accusations of war atrocities). In March 1945, the Ukrainian National Committee was set up after a series of negotiations with the Germans. The Committee represented and had command over all Ukrainian units fighting for the Third Reich, such as the Ukrainian National Army. However, it was too late, and the committee and army were disbanded at the end of the war. ^ Bauer, Yehuda: "The Holocaust in its European Context Archived 2006-10-24 at the Wayback Machine" pg. 13-14. Accessed December 24, 2006. ^ Potichnyj, Peter J.: "Ukrainians in World War II Military Formations: An Overview". Accessed December 24, 2006. ^ a b c d e Alfred J. Rieber (2003). "Civil Wars in the Soviet Union" (PDF). 4/1. Project Muse: 133, 145–147. Slavica Publishers. ^ Tadeusz Piotrowski (1997). "1. Soviet terror". Poland's Holocaust: Ethnic Strife, Collaboration with Occupying Forces and Genocide in the Second Republic, 1918-1947. McFarland. pp. 11–12. ISBN 978-0786429134. ^ Tauger, Mark (Spring 1991). "The 1932 Harvest and the Famine of 1933". Slavic Review. 50 (1): 70–89. doi:10.2307/2500600. JSTOR 2500600. ^ a b Thurston, Robert (1996). Life and Terror in Stalin's Russia, 1934-1941. ^ a b John A. Armstrong, Collaborationism in World War II: The Integral Nationalist Variant in Eastern Europe, The Journal of Modern History, Vol. 40, No. 3 (Sep., 1968), p. 409. ^ Ivan Katchanovski, Ph.D. (2010), Terrorists or National Heroes? Politics of the OUN and the UPA in Ukraine. PDF file, direct download. ^ Katchanovski 2010, page 9. ^ Jürgen Matthäus. Jewish Responses to Persecution: 1941–1942. AltaMira Press. p. 524. ISBN 0759122598. ^ Ganuz, I.; Peri, J. (28 May 2006). "The Generations of Stepan: The History of Stepan and Its Jewish Population". jewishgen.org. Retrieved 25 May 2016. ^ "The Holocaust Timeline: 1941 - July 25 Pogrom in Lvov/June 30 Germany occupies Lvov; 4,000 Jews killed by July 3/June 30 Einsatzkommando 4a and local Ukrainians kill 300 Jews in Lutsk/September 19 Zhitomir Ghetto liquidated; 10,000 killed". yadvashem.org. Retrieved 26 May 2016. ^ "The Holocaust September 1, 1941: Ukraine". NAAF On-line Holocaust Project. Archived from the original on 24 January 2012. ^ a b c Richard J. Evans (2009). The Third Reich at War: 1939-1945. London: Penguin Books. pp. 203–223. ISBN 1101022302. ^ Jakob Weiss, Lemberg Mosaic, p. 173. ISBN 0983109117. ^ Lucy S. Dawidowicz (1975), The War Against the Jews 1933-1945, Bantam Books Inc., New York, p. 171. ^ Markus Eikel (2013). "The local administration under German occupation in central and eastern Ukraine, 1941–1944". The Holocaust in Ukraine: New Sources and Perspectives (PDF). Center for Advanced Holocaust Studies, United States Holocaust Memorial Museum. 110–122 in PDF. Ukraine differs from other parts of the Nazi-occupied Soviet Union, whereas the local administrators have formed the Hilfsverwaltung in support of extermination policies in 1941 and 1942, and in providing assistance for the deportations to camps in Germany, mainly in 1942 and 1943. ^ Yitzhak Arad (1987). Belzec, Sobibor, Treblinka: The Operation Reinhard Death Camps. Indiana University Press. p. 21. ISBN 0253342937. ^ Gregory Procknow (2011). Recruiting and Training Genocidal Soldiers. Francis & Bernard Publishing. p. 35. ISBN 0986837407. ^ Himka, John-Paul (1998). "Ukrainian Collaboration in the Extermination of the Jews During World War II: Sorting out the Long-Term and Conjunctural Factors". In Jonathan Frankel (ed.). Studies in Contemporary Jewry: Volume XIII: The Fate of the European Jews, 1939-1945: Continuity or Contingency?. XIII. Oxford University Press. pp. 170–190. ISBN 978-0-19-511931-2. Archived from the original on January 6, 2012. ^ "Belzec: Stepping Stone to Genocide, Chapter 4 – cont". JewishGen, Inc. February 13, 2008. Retrieved May 7, 2016. ^ State Memorial Complex "Khatyn" official web-page http://khatyn.by/en/genocide/expeditions/ - The destruction of the village of Khatyn is a tragic and vivid example. The village was annihilated by the thugs from the 118th police battalion which was stationed in a small town of Pleschinitsy and the thugs from the SS battalion "Dirlewanger" which was stationed in Logoisk. ^ a b Melnyk, Michael. To Battle: The Formation and History of the 14. Gallician SS Volunteer Division. Helion and Company Ltd.
^ Litman, Sol (2003). Pure Soldiers or Bloodthirsty Murderers? : The Ukrainian 14th Waffen-SS Galicia Division (Hardcover ed.). Black Rose Books. ISBN 1-55164-219-0. ^ Logusz, Michael. Galicia Division: The Waffen-SS 14th grenadier Division 1943-1945. Schiffer Publishing. ^ Tessin, Georg / Kannapin, Norbert. Waffen-SS und Ordnungspolizei im Kriegseinsatz 1939-1945.ISBN 3-7648-2471-9 p.52. Gilbert Martin (1987). The Holocaust: A History of the Jews of Europe During the Second World War (Reprint ed.). Owl Books. ISBN 978-0-8050-0348-2. Gilbert Martin (1986). The Holocaust: The Jewish tragedy (Unknown Binding ed.). Collins. ISBN 978-0-00-216305-7. This page was last edited on 22 February 2019, at 10:29 (UTC).